I recently used social media to crowd-source favorite lunch deals around town and the results were a bit upsetting. So-called "friends" came out of the woodwork to share their favorite diners, cafes and food trucks. It's like, where were you, ex-co-worker of 10 years ago, when I posted that hilarious video of my dog snoring? Where was my old hairdresser when I shared that clip of the iguana running away from the snakes that everyone has seen a million times? And my amazing photo series on hilariously bad parking jobs? Not a peep out of the local politicians who were so eager for my friendship at election time. In the end, my bitterness was overcome by the overwhelming response and the excellence of the suggestions, proving once again that the way to my heart is through a good sandwich. The phrase "lunch deal" is a bit vague and people interpreted it in a variety of ways. 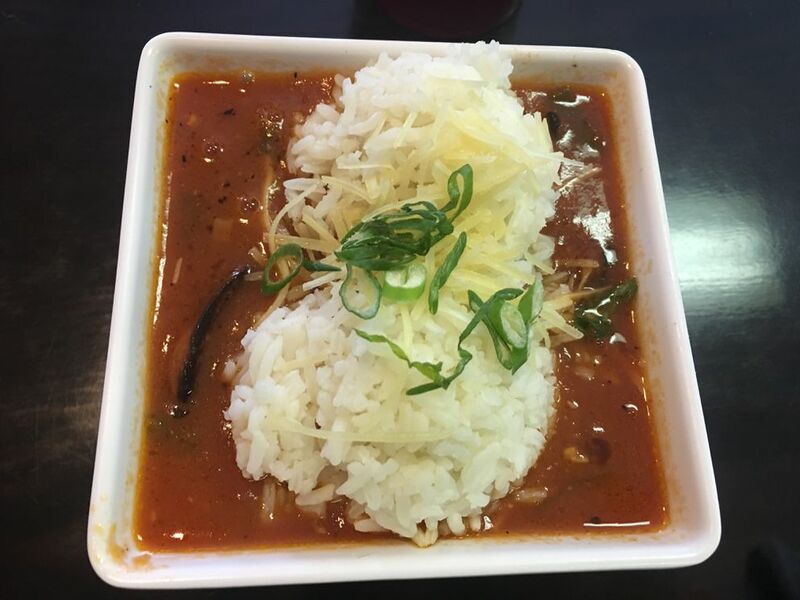 I landed on three separate criteria: a pricey eatery that is a bargain at lunchtime; a restaurant that offers a special dish (or dishes) available only at lunchtime; or a spot that offers a high level of tranquility to offset the stress of a busy workday. There were so many good suggestions, that this roundup will be in two parts. Luckily, you don't have to read my Facebook posts to get the benefit of my lunch research. I'm sharing phase one completely free of hilarious cat videos. The restaurant most frequently (and vehemently) recommended was Club Paris. And it was the one lunch spot I sampled that met all three of my criteria. First, it's quite an expensive spot for dinner, so lunching there is a good way to get an old-school steakhouse fix without old-school steakhouse prices. Second, Club Paris has a "Mad Men"-esque atmosphere that allows you to pretend that a three-martini lunch is still a thing. In Club Paris, it's always "6 o'clock somewhere." Third, and most importantly, lunch at Club Paris features their (at least locally) famous filet mignon burgers, ground in-house from filet mignon trimmings. This burger is not available at dinner. I repeat. This burger is NOT available at dinner. Thick, juicy, perfectly cooked and well-seasoned, this burger is worth the trip ($11.50 for the most basic version, $13 for added bacon and cheese). In earnest, daylight-flooded contrast to Club Paris is Side Street Espresso, which has the low-key charm and eclecticism of a pre-hipster college town coffeehouse. There is a visitors' book at the door, a Buddha shrine, a thickly covered bulletin board of community events and a gallery of artwork on the walls. 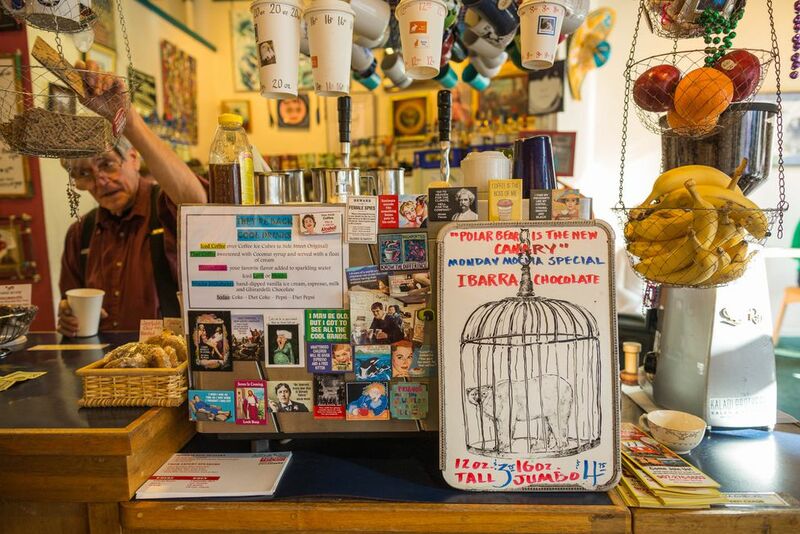 The artist is George, who along with his wife Deb has owned and operated the cafe since 1992. His whimsical work is one part coffee-related and two parts current events, making the pictures both appetizing and topical. George was also the chief barista at the time of my visit. The cafe offers newspapers, a lending library and a stack of board games, but no Wi-Fi — a good metaphor for the cafe's unplugged philosophy. A frugal $6 gets you a generous mug of housemade soup (I opted for the creamy, hearty and soulful cream of potato leek) and two thick slices of locally baked sourdough toast from Rise & Shine Bakery. The meal is a bargain, but the mental reset button that got pushed when I walked in was the real value for me. As I sipped and read and munched, I noticed that George greeted every afternoon customer by name. New 2017 resolution: to be called by name by George. 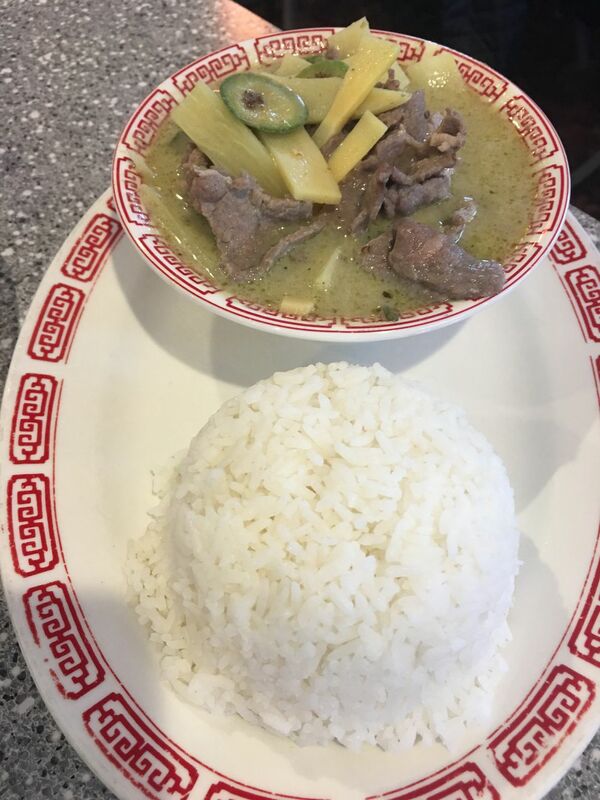 My editor's choice for best lunch deal in town was Anchorage stalwart Pho Lena, which boasts expansive new digs in Spenard with ample parking, comfy booths and lots of windows. 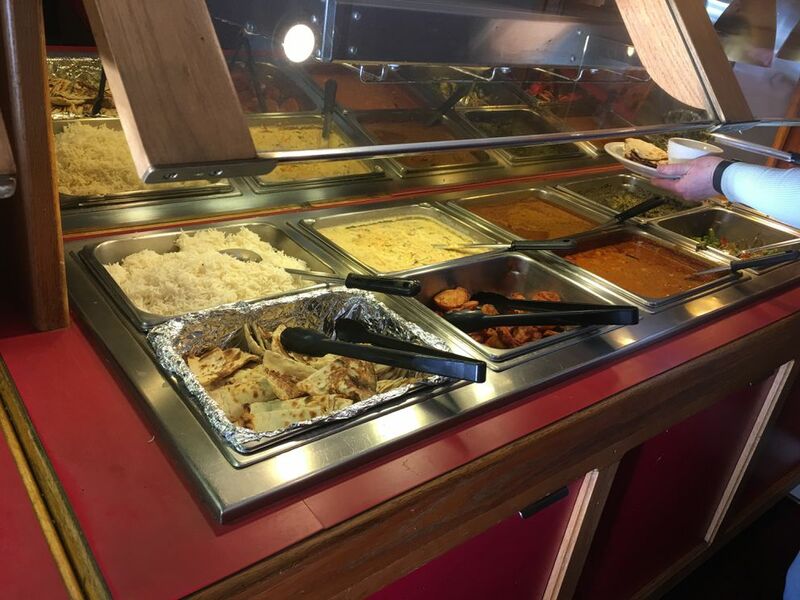 Their $9.95 lunch special includes a choice of one of 13 entrees (ranging from teriyaki to curry to noodles to a Vietnamese sandwich) plus a cup of the day's special soup and choice of an egg roll, fresh roll or salad. The soup of the day on my visit was Lao Kao Peak Sen — a silky chicken variety with thick, comfortingly starchy, udon-like rice noodles, a perfect start for a snowy lunch hour. My green curry with chicken, bamboo shoots and Thai eggplant was light and brothy — unlike some versions, which can be overly creamy, especially for lunch. Service is quick and pleasant, and I'm a big fan of their innovative "leftovers" station at the door. A variety of to-go containers are available for you to box up your meal. It's a time-saver and a face-saver if you, like me, always want to save that one scoop of curry or one bite of egg roll but are too embarrassed to ask. Pho Lena offers up a conveniently, reliably delicious lunch with a bargain price tag. Gumbo House breaks one of my rules in that its menu is the same all day. However, their gumbo and jambalaya dishes come in "bowl" and "bucket" sizes, and the gumbo bowl is the perfect portion for lunch ($8.25 for chicken, $10.99 for shrimp or oyster or the "kitchen sink" — I recommend splurging). Depending on your appetite and willpower, a bowl-sized gumbo can (and probably should) be parlayed into two lunches. Full disclosure: I have never successfully done this. This gumbo, with its deep and smoky roux, is dark, robust and teeming with meat and seafood. The jambalaya ($10.99) is similarly replete with choice bites of chicken, shrimp and sausage, but I'm loyal to the gumbo. Added bonus: On a recent Friday afternoon, a gentleman guitarist was serenading the lunch crowd. Live music at lunch? During the week? Why not? Laissez les bons temps rouler! Hearth Artisan Pizza is tucked far enough back in the busy Northern Lights strip mall that even during a busy lunch hour it feels cool, quiet and civilized. It's a nice oasis in an otherwise bustling part of town. 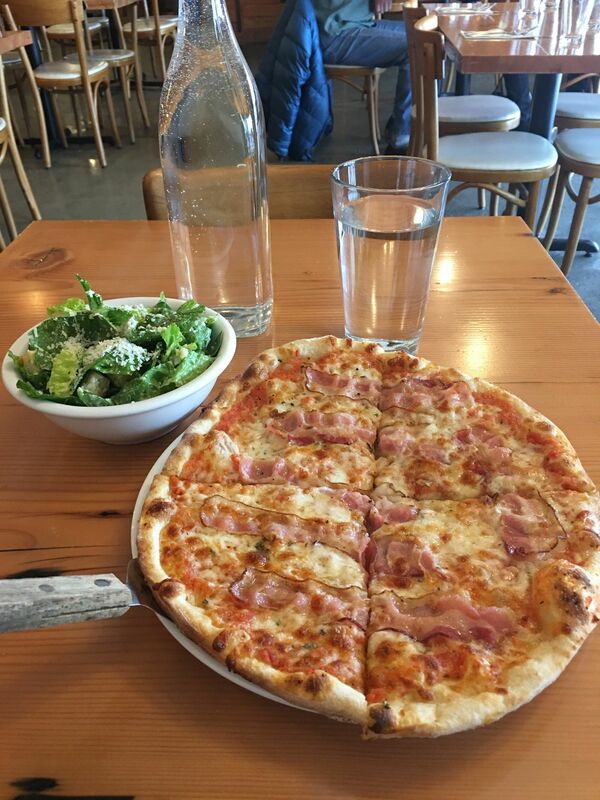 Their recently introduced lunch special, which includes a personal pan pizza and a side salad for the fantastic price of $10, is another reason to duck in and take a well-catered breather. Three pizzas are on offer, including a daily "chef's special" pizza, a basic margherita and the Little Piggy, which features a tomato sauce base, provolone cheese, rosemary and cured bacon. Guess which one I chose? The Little Piggy is a sophisticated pie. With its almost-translucent slices of silky, buttery bacon, and its fragrant, pine-y rosemary, the pizza is — like the restaurant — rustic, yet refined. An acidic, garlick-y side Caesar makes this a contender for best lunch bargain in town. I'm usually a bit distrustful of buffets. I associate them with soggy food that should be crispy. Or crispy food that should be moist. Or warm food that should be hot. Or warm food that should be cold. Or … well, you get the idea. But I love Indian food. And I love choices. So I quashed my doubts and headed over to Bombay Deluxe to try out their lunch buffet ($12.95). And I'm so glad I did. This buffet is a serious bargain. Soup, salad, Tandoori chicken, potato pakoras, chicken curry, spinach saag, black lentils, mattar paneer (Indian curried peas with cheese), and even two desserts were among the day's offerings. I made two trips: piling up my first plate with the rich, creamy, protein-heavy dishes and then returning a second time for a slightly penitent plate of kuchumar salad, spiced raw onions, and some rice with the addictive mint chutney and raita. It turns out that Indian food is well suited to buffet-style dining, with its spicy, saucy dishes and crispy, raw garnishes. An added bonus was the very friendly service. My iced tea, served masala style, was liberally spiced with cloves and I was so taken with it that my server brought me a refill in a to-go container as I left. My faith in buffets is restored. Do you have a tip for a great lunch deal? Write us at dining@alaskadispatch.com. Location: 417 W. Fifth Ave.
Two locations: 9191 Old Seward Highway and 611 W. Ninth Ave. Location: 555 W. Northern Lights Blvd.